These reversible cloth napkins are designed to be wrinkle and stain resistant and feature a seamless design with serged edges. Because the napkins are made of durable polyester, they are machine washable and can be used countless times. Reversible with one side faux dupioni and the other side satin, there is value in the multi-use potential. 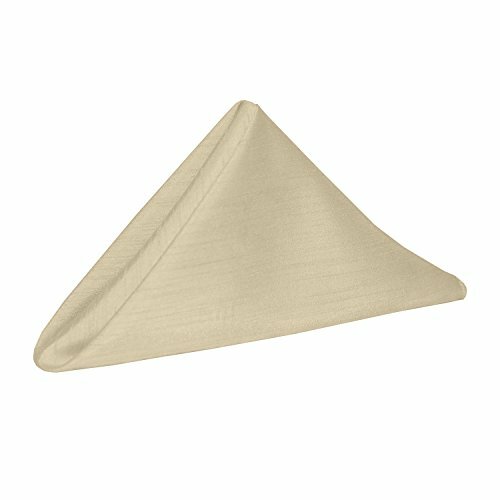 The Tan Beige 20 x 20 Inch Square Polyester napkins are an excellent choice for your wedding, party, home dining, Christmas and Thanksgiving dinners and other special events. Due to variations in computer monitors, colors shades may vary in appearance from screen to screen. Please search Ultimate Textile for matching and complementary items in all shapes and sizes.